For the third year in a row, Ontario has the lowest registered nurse (RN)-to-population ratio in the country. Figures released on June 14 by the Canadian Institute for Health Information (CIHI) show that Ontario's RN-to-population ratio continues its downward trend. CIHI figures show the province has only 669 RNs per 100,000 people, compared to 828 RNs per 100,000 people across the rest of Canada. This puts patients at risk. 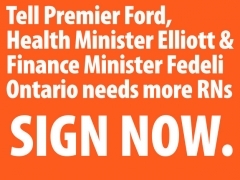 Ontarians need more RNs to deliver quality health care in a timely matter. That's why RNAO was pleased that then-Premier-designate Doug Ford clarified that nurses are not included in the public sector hiring freeze announced on June 18.